You open your credit card statement and discover you forgot to make last month's payment. Or you get a call from a collection agency about a medical bill you didn't realize hadn't been paid. Or you check your credit reports and discover a late payment is marring your otherwise perfect payment history. How bad is it? How much does a single late payment affect your credit scores? Of course, as with so many things related to credit scores, the answer is, "It depends." But the irony is, the better your credit, the more you may feel the sting. If you're lucky, the lender won't report that you were late. "The first thing to note is that most lenders do not report missed payments until the account is 30+ days past due," says Anthony Sprauve, director of public relations for MyFico.com. "Suppose a given credit card payment is due on May 15 [and] the payment is made on May 25. Technically the payment is late, and fees and interest charges may apply. But in most cases, this late payment would not be reported by the creditor to the credit reporting agencies [CRAs]." Or it's possible your lender may be willing to overlook the transgression. Steve Ely, president of eCredable.com, adds: "The larger creditors [like credit card companies] usually have sophisticated analytic models working behind the scenes that take into account your history of payments. If you've been paying on time for a long time, they're likely to forgive your one late payment, and let it slide." 1. How long ago did the most recent late payment occur? 2. How severe were any late payments (30 days, 60 days, charge off, etc.)? 3. How many accounts on the credit report have had late payments? "Of these three questions, the one typically having the most impact on your credit score is the first; recency," he says. "To illustrate, if a single late payment occurred a few years ago and all payments on all accounts have been made on time since, that single late payment will have little negative impact on your score. On the other hand, according to a study conducted by FICO on credit scoring impacts, a recent late payment can cause as much as a 90-110 point drop on a FICO score of 780 or higher." "And while any negative score impact from a late payment lessens over time, this information will remain on your credit report for seven years and can be expected to continue to impact your score, at least to some degree, for much of that time," he adds. The impact to the FICO score resulting from a new delinquency hitting the credit file can vary significantly depending upon the individual consumer's circumstances. The bottom line? One slip up and your credit score may take a dive, especially if you have otherwise stellar credit. 'The old analogy of 'the bigger they are, the harder they fall' applies to credit scores, too," warns Ely. "If you have a really high FICO score, you'll take a bigger hit for a late payment than someone with a lower FICO score." 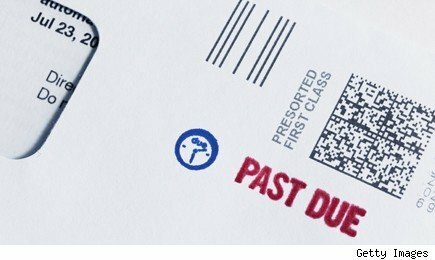 While the best defense is to be meticulous about paying your bills by the due date, if you do mess up, see if you can't persuade the lender or collector to remove the blemish from your reports. While they may balk at first, you may be able to get them to change their mind if you have a good explanation as to why it happened -- and if you can convince them it won't happen again. Credit.com's Personal Finance Expert, Gerri Detweiler focuses on financial legislation, budgeting, debt recovery and consumer savings information. She is also the co-author of Debt Collection Answers: How to Use Debt Collection Laws to Protect Your Rights, and Reduce Stress: Real-Life Solutions for Solving Your Credit Crisis as well as host of Talk Credit Radio. Reach Gerri at creditexperts@credit.com.